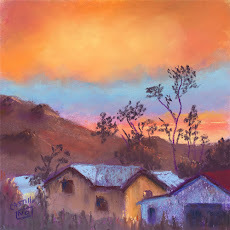 Jo Castillo Art Blog - Pastels and More: Yay! An Almost Pastel Painting! Yay! An Almost Pastel Painting! 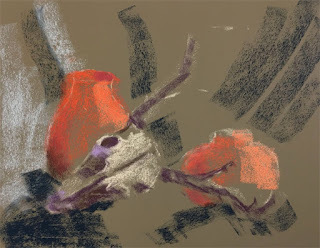 Yesterday was the plein air painters day. It was about 46 degrees or so at 10:00 a.m. when we started to paint. We are a bit wimpy so we decided to do a still life in the Art Center again. I'm sure to all the plein air folks up north, that would have been a balmy day and they would have loved to be outside, working away. I took my pastels to sketch/paint with. I'm a bit burned out on sketching and using the watercolors. 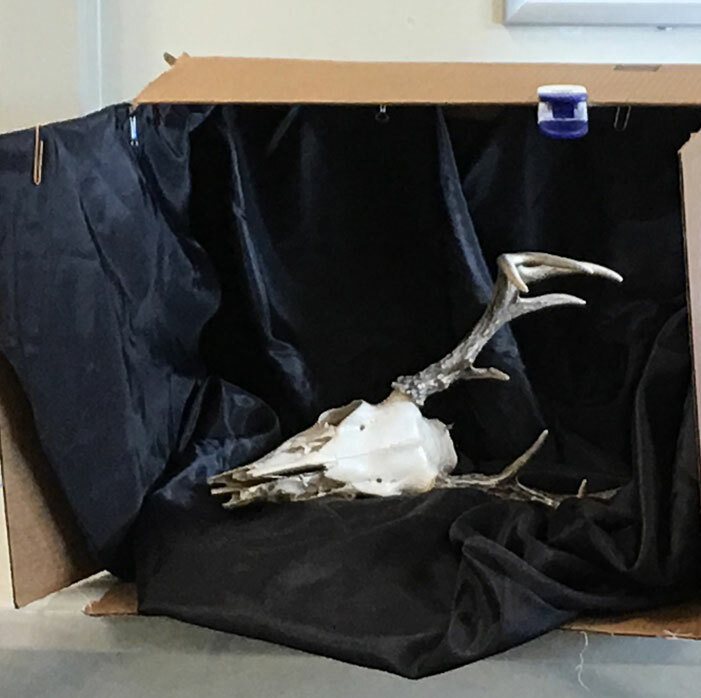 The set up was a skull from a small deer that Joan brought. I thought it was a bit colorless so added some pots "hand made" from my memory. I started on a "new" piece of tan Pastelbord. Brown and tan are not my colors so I knew I was going to cover the tan. I didn't do an under painting with water which is what I would have normally done. It would still be waiting to dry and you know me about waiting for paint to dry. The results of about an hour and a half with the pastels. I'm happy with the over all effect. I will ponder the idea of finishing it for framing. The cloth and horns need work. In real life the horns in my painting are darker. I would also make the cloth a bit more cloth-like. I'm thinking that part of the reason I feel it is a pretty good start is that I didn't know what we were going to paint. I approached it like a sketch not worrying about whether it would be a good painting or not. I used my easel and stood to paint. Hmmm. We went to lunch at Macocos again. It was good, Mexican food in the Yucatan style. After that I met Gene at the food trailer by the Art Center and we sat outside while he had a hamburger and I drank a Coke from Mexico with real sugar. It was a good day. This looks great, Jo - I love the pots you just came up with! I think the colors are excellent. Joanna and Regina, thank you so much. It was almost fun painting. Evil grin. I'm not big on painting skulls and such, but this worked well for you. 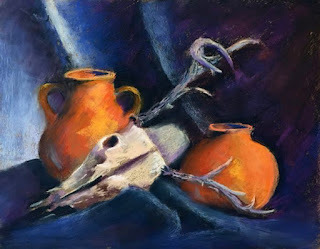 I think it is the colors and boldness and contrasts that make it really nice. You did good! Looks good Jo! I think you are happier with the pastels...that plays into it too. Bravo! Hi, Rose. Thanks a bunch. Your new works are super! Jennifer Rose, thank you. I'm glad you agree with me on the temps!